1.Mix lemon juice in � cup of hot water and put aside. 2Boil the 4 cups of milk in a heavy bottomed pan over medium heat, stirring occasionally, making sure not to burn milk. 3.As the milk comes to a boil, add the lemon juice gradually and stir the milk gently. The curd will start separating from the whey, turn off the heat. 4.Once the milk fat has separated from the whey, drain the whey using a strainer line with cheesecloth, or muslin cloth. 5.Wrap the curds in a muslin cloth, rinse under cold water, and squeeze well. This process takes out the sourness from the lemon. 6.To take out the excess water, squeeze the wrapped paneer. Do not knead the paneer. 7.Boil remaining 4 cup of the milk in a heavy bottom frying pan on medium high heat until the milk reduces to about two cups. 8.Make sure to frequently stir the milk as the milk burns easily in bottom of the pan. 9.Add the paneer in the milk and keep stirring till the mixture thickness and form a soft dough consistency. 10.Add the sugar and continue to cook and stirring until the mixture become soft lump and start leaving the pan from sides. 11.Pour it over greased plate keeping about half inch thick. Putting few spoons of water in pot before putting milk reduces burning the milk bottom of the pan. 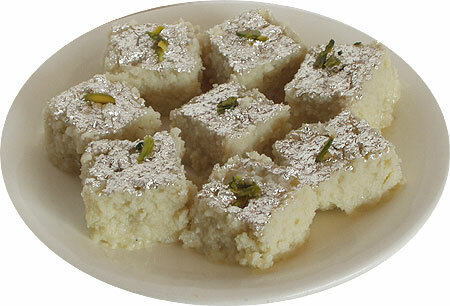 If kalakand is too soft put the plate in microwave oven (plate should be microwave safe) for 2 to 3 minutes. Making sure kalakand don�t become dry.